For whatever reason, He slept through the storm. As the ship took on water, jeopardizing their voyage and their lives, the Master slept. Perhaps He was exhausted, or just that filled with peace. But regardless of the reason, there He remained, "in the hinder part of the ship," unaware of the tempest, "asleep on a pillow." Terrified fellow travelers awakened Him with the question, "Carest thou not that we perish?" He did care. He arose and took action, rebuking the storm, commanding the sea. And there was great calm. "Why are ye so fearful?" He asked. "How is it that ye have no faith?" "What manner of man is this?" they asked one another, bewildered. "Therefore what manner of men ought you to be?" the Lord later asked his Nephite disciples. "Verily I say unto you, even as I am." We live in a world tempest tossed. Even a cursory look around ought to alarm us and send us crying to the Lord because "we perish." The political, economic, medical, educational, social, religious, and spiritual condition of this fallen world have reached such a point of depravity and desperation that even the angels are begging the Lord day and night to be allowed to come and reap down the earth. The day cometh that shall burn as an oven, and yet, we sleep. Pacified, entertained, well fed and clothed, deceived that we’re invincible, flattered that we’re chosen, and lulled into carnal security, we allow the devil cheat our souls and lead us away, carefully, down to hell. (2 Nephi 28:21) No matter what else may be wrong in the world, all is well in Zion, after all. There are no beheadings, bombings, ebola, drought, recession, race riots, unemployment or ISIS here, right? Zion prospereth! Therefore, what need have we to fear? It’s a lovely, deadly dream. When you think about it, sleep is a form of death. One who is asleep, though yet alive, is insensitive to all that is happening, non-responsive to the environment, and therefore, symbolically at least, dead. Swept away into a world of dreams, blissful or terrible and seemingly real, the sleeper inhabits a false reality, oblivious to the actuality of the situation. 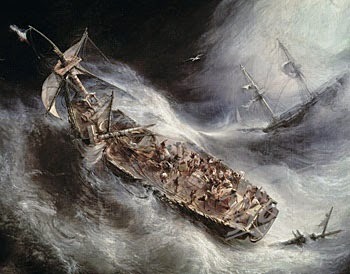 And so, as we sleep, the ship is overwhelmed with water, tossed in the tempest, and on the verge of sinking. “We perish” is not a fearful exclamation, but a profoundly accurate assessment of our condition. 22 That ye may not be cursed with a sore cursing; and also, that ye may not incur the displeasure of a just God upon you, unto the destruction, yea, the eternal destruction of both soul and body. Lehi may have been speaking to his sons, but this passage is in the book for US. I don't believe anything ended up in the Book of Mormon by accident. It was all pointed toward us, and toward our day. And in a larger sense, part of the outcome we hope for in this world includes entering into a family relationship with Father Lehi ourselves. But that's another topic. The first command brought Benjamin out of sleep and to his senses. But the angel commanded him again to awaken—this time to the word of God. It's not enough to simply become aware of our surroundings. Until we awaken to understanding God's word, we are still spiritually asleep. Until we hearken and obey, we are in eternal peril. Lehi next pleads for his sons to "shake off the awful chains by which ye are bound." Therefore, by Alma's definition, these chains are ignorance of God's mysteries, caused by the hardness of our hearts! Over a dozen times, the Book of Mormon warns us of these awful chains and the captivity of hell they represent. Ignorance will damn us! Isn't it odd that such chains of captivity and death can simply be "shaken off?" There are no locks to pick, no bars to cut, no miraculous bursting strength required. It's almost as if we're voluntarily wearing the chains, and we can "shake them off" whenever we choose to. So how do we do that? Well, according to Alma, we soften our hearts and seek God's word. I know, too simple, right? But hard heartedness is the leading cause of our spiritual blindness. It rejects truth, and causes anger, violence, and destruction. It is one of Satan's greatest and most effective tools, especially among the religious. If you don't fully understand hard heartedness, please read my post on it. When your heart is soft, you are equipped to seek God's word. That means the scriptures, as well as God's word to you, directly, through revelation. BOTH are required for you to shake off the chains. Both must be sought diligently until you receive understanding. Lehi next counsels his sons to "arise from the dust." How do we do that? This solution works. This is not some metaphorical, abstract concept about repentance. It is literal. When you come to view yourself in your fallen, carnal state, cry to the Lord using those same words. Ask for the atoning blood to be applied to you, personally, and see what happens. How does it feel to arise from the dust? According to Lehi, having applied the atonement and arisen from our own dust, we are then prepared to "be determined in one mind and in one heart, united in all things." What's that all about? This is about Zion itself! This is the path leading to the goal the prophets have foreseen for millennia; the goal we all profess to seek in the last days. But Zion will not—and cannot—come until there are people who awaken and arise just as Lehi begged his sons, and continues to plead with us even today. If we refuse to take his advice, all that remains is "a sore cursing" and "the displeasure of a just God upon you, unto the destruction, yea, the eternal destruction of both soul and body." In fact, when you look at it, the Lord's people who are prepared to meet Him when He comes, simply aren't found lounging around, being entertained, calling themselves righteous, and relying on others to teach them what they need to know. No, those who are prepared to meet their Master are found following the example of the Master. They arise. It is no wonder then, that the first command given to Adam, who represents all of us in the endowment, is to "awake and arise." Until that happens, no other spiritual progress is possible. Please wake up! Don't wait until it's "everlastingly too late." Don't let the devil lull you away into carnal security, and bind you with his chains, flattering you that "all is well in Zion." All is NOT well in Zion. In fact, Zion doesn't even exist here on this earth. Not even close. And unless enough of us awake and arise, Zion will not come, but destruction will. There simply is not time to be an "average" or "mainstream" anything. No church can save you; no man can save you; no checklist can save you. 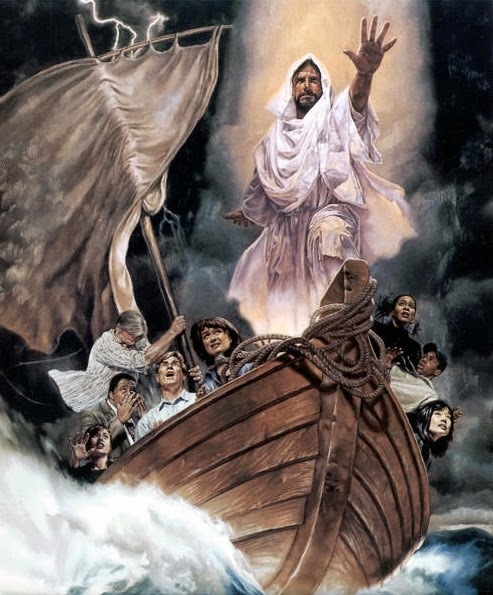 Only Christ can save you, and he showed you what to do that day in the boat. He awoke. More precisely, He was awakened by someone else. You must awaken as well, and if nobody has yet shaken you, I hope to now. He arose. He got on His feet, surveyed the situation, and acted. The time for sleeping was past; the crisis was upon them, and if He did not act, danger and death awaited, not only for Him, but for those He could help. Our Lord refused to idly let that happen. Faith requires action, and so He acted. And then, as He asked His disciples, He now asks each of us: "Where is your faith?" I've written a number of blog posts about the unbeliefs that blind us to the truth, prevent our faith, and bind us down to destruction. We have been, and still are taught the philosophies of men, mingled with scripture. We blindly rely upon practice ordinances, convinced we have the real thing. We've destroyed the pure doctrine of Christ, teaching instead the commandments of men. I'm hoping these things alarm you. I'm hoping you'll ask questions, go to the scriptures, hunger and thirst, and cry unto the Lord. I'm hoping you'll wake up. Please don't simply dismiss all this with blind reliance on mortal leaders. The responsibility is upon YOU. It always has been. Are you awake? Are you alarmed? Have you fully come to appreciate the boat we're in is old and unrepaired, listing to port, taking on water, broken masted, splintering, and ready to sink with the next wave crash? That the mortal man we call captain can't save the ship or even save you? Have you fully appreciated the last, greatest enemy that confronts us all? We Perish! If you've awoken and realized your desperate plight, don't despair. Have faith. Stand up and look around—not at the waves and the wind, but at that man, ignored, patiently waiting on a pillow in the hinder part of the ship. He can save you if you ask Him. He will save you if you reach out to Him. You cannot stop the waves and wind, but He can. He is the God who subdues all enemies under His feet, including the water upon which He walks. He knows what to do; He has calmed tempests before. He has subdued death, hell and the devil. He is our only hope. [UPDATE 10/16/14: I posted this entry several days before October General Conference. I think Elder Ballard's address, "Stay in the Boat and Hold On!" provides important food for thought. He recommends we focus thus: “Keep the eyes of the mission on the leaders of the Church. … We will not and … cannot lead [you] astray." He further recommends, "teach your missionaries to keep their eyes on us"
Thank you. I am awake but afraid to arise. You have given me courage. I love these truths. Thank you for laying them out so perfectly. I'm RLDS or what's left of it. Just read your profile. Amen! We make this religion thing more important than God. It's become our very idol. The Achilles heel of the Restoration, worship of our church, rather than our God. The church has been taken from within. But it's nearly time to come out of the closet. No more hiding. James. Enjoyed your comment. If you read Hugh Nibley 's little pamphlet " When the lights went out" about the apostasy of the primitive church he says the very same thing . This commandment is meant to be kept between three beings, the Father, the Son and the Holy Ghost. May we all Awkae and Arise, and Stand before God! Met you at the Logan lecture. I appreciate your words here. So... would this be the same ship Zion that Elder Ballard counseled us to hold onto with both hands Sunday afternoon? Fantastic Adrian! Adam needed to awake and arise.. Adam needed to realize he is Micheal. Adam is every man. We need to awake and arise and realize who we ARE. Great post. Awake and Arise...and Stand. HappySeeker, that would be a yes. Adrian, this is Mike Guthrie. I think you know that my friendship and love for you and your family is genuine. These posts have really concerned me though. I believe you started out intending to bring people close to Christ, but these posts just criticize the church and it's leaders. I do not follow anything blindly, but have received a powerful witness of several truths. First that Jesus is the Christ and our Savior, second that the Book of Mormon is true and Joseph Smith is a prophet. Also though, when ai stood and sustained President Monson after President Hinkley passed away, the spirit bore a powerful witness that he is a prophet of God. Please look at the fruits of your posts. I believe they are feeding criticism and pride and pulling people further from God not closer. The church is not perfect, just like we are all imperfect who are members. The wheat and the tares are all growing together. The criticism of the church leaders and policies, however, is not the way to draw closer to God. I believe it does the opposite. I recognize many truths in your writings, but I also recognize many subtle twists that change the meaning or lead the reader down self justifying paths. Like I said, I love you man, but as I read these posts I have concern for you, your family, an the people who read this that may be easily swayed in their testimony. There are so many influences bringing people away from The Lord in this world, I fear you your posts are doing that very thing, even of it is not your intention. I love you man, and hope this is received in the spirit of love that I send this. It's great to hear from you! Thank you so much for reading my ramblings and caring enough to let me know your thoughts. Feedback like yours helps me improve. My intent is only to challenge those things that are keeping us from coming unto Christ. As you mentioned, we are imperfect, and the church is also imperfect. This shouldn't cause us fear, but rather a desire to improve. We can't improve until we recognize the need to do so. Hence, my chicken scratches. Some of the things that keep us from Christ are cultural, and pointing them out may make us uncomfortable. But our culture isn't Christ. When unbelief inhibits our progress, we need to have the courage to confront our unbelief. Similarly, the church isn't Christ. Where there are errors preventing faith, they must be recognized and shunned. Some are offended by this because the church or its leaders have become the object of their faith, rather than the Lord Himself. As long as faith is in Christ and Him alone, correction is not a source of fear, but rather a source of light. As you read what I've written, I encourage you to ask yourself in an unbiased way whether what I've written is true or false according to scripture and fact. If false, I need, and appreciate, correction. If true, then no matter how uncomfortable or unpleasant it is, we must consider how we need to change. All of us are subject to error. The scriptures show us the clear path to truth, and the signs that we have received truth. Until those signs are present, the search must be relentless. Time is short, and the need is urgent. So I write what I must, no matter how uncomfortable it may be. And I promise, whatever your concern about these things, mine is greater. It speaks volumes about you that you care enough to comment, and I can feel your love. I know your intent is born of love and a desire to bless me and my family, and I am very appreciative. May God bless us both in our search to find Him. Thank you for you efforts in bringing us to Christ. In response to Mike's post: if anyone has drawn further away from God by reading your blog it is because they are heeding your advice to remove the yoke of the church, but have failed to fulfill the underlying plea: take up the yoke of Christ, it is easy, and His burden is light. Your testimony has touched me, and I am grateful you have organized here many thoughts that I have had for years. The scriptures are true. 2 Nephi 28 speaks of US, not THEM, as we are always taught.